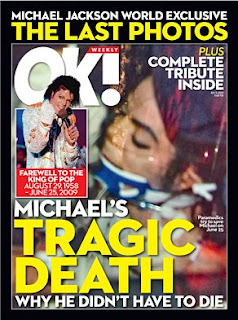 "OK" Weekly Magazine which published from US, has Paid $500,000 For Michael Jackson Death Photo. A knowledgeable source said British parent Northern & Shell paid the equivalent of roughly U.S. $500,000 for exclusive magazine rights to the photo in the U.S. and U.K. ET has the exclusive last photo of Michael Jackson before his death. Jackson passed away Thursday afternoon. He was 50. Click for complete coverage on Michael Jackson Investigation.